Beat the cream and confectioners' sugar in a large bowl with an electric mixer on high speed until stiff peaks form. Fold in the crème fraiche. Spoon 2 tablespoons whipped cream mixture into each pastry shell. Top each with 1 tablespoon berries. Repeat the layers. 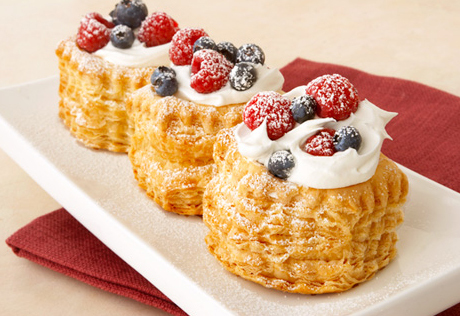 Top each with 1 tablespoon whipped cream mixture and 1 berry. Sprinkle with additional confectioners' sugar, if desired.